HDFC and HDFC Bank are massive wealth creators for investors in the Indian stock market. A small sum of Rs 10,000 invested at the time of listing would have grown to Rs 10 million and Rs 2.4 million in HDFC and HDFC Bank respectively. Now if you couldn't invest at the time of listing then you need not worry as both these stocks continue to offer lucrative investing opportunity regularly. I wrote about one such opportunity to my Profit Hunter Pro subscribers in a letter published on Monday, 25th March 2019. I showed 2 ratio charts, first of REC-PFC and second of HDFC-HDFC Bank. An earlier study of ratio charts of REC-PFC indicated REC was undervalued compared to PFC and provided a good trading opportunity. REC moved on expected lines and now the ratio chart of HDFC-HDFC Bank also indicated that HDFC was undervalued compared to HDFC Bank. At Profit Hunter Pro, we use a ratio chart to measures the relationship between two stocks. It is calculated by dividing the price of one stock by another. Normally, you divide the high-priced stock by the low-priced stock. But in case of HDFC and HDFC Bank, we divide the price of HDFC Ltd. by price of HDFC Bank since HDFC Ltd was the higher priced stock until a few months ago. So, it basically helps us to compare the performance of HDFC relative to HDFC Bank. The ratio of HDFC-HDFC Bank was placed near 83. The ratio had found support around levels of 83 for several times over the last one and half year. Past price action suggested the ratio could once again find support around the same levels. This meant that HDFC Ltd. was undervalued compared to HDFC Bank and chances of outperformance by HDFC Ltd. were high. Massive outperformance by HDFC Ltd.
Professional traders use such kind of opportunities to do specific type of trades knows as pair trades. The aim of pair traders is to profit by exploiting the relationship between two securities regardless of market direction. They buy the underperformer and short sell the outperforming stock. The benefit of buying one and selling other stock is that one can make money regardless of market direction. One is not dependent on market direction but on the relationship between two stocks. Bullish traders can profit only when markets are rising. Bearish traders can profit only when markets are falling. But that's not the case in pair trading. Apart from this the risk is also controlled to an extent as both the trades acts as a hedge for each other. Drawdowns are also smaller when one is trading pairs. So here in case of HDFC and HDFC Bank, professional traders would have bought HDFC Ltd since it was undervalued and shorted equal value of HDFC Bank in futures. I'm assuming a trader enters the trade one day after I published the letter at closing prices. So, the trader buys 1 lot of HDFC Ltd. in futures which is of 500 shares. The contract value of this trade would be Rs 9,81,425. He will also enter a short trade in 2 lots of HDFC Bank on the same day at price of 2,330.70. The contract value of this trade would be Rs 1,165,350. It is important that the contract value of both the trades should be closer to each other to maintain cash neutrality. Now the stocks moved as expected. Let's see how one could have netted gains of Rs 59,250 in 10 days. HDFC Ltd. moved up more than 100 rupees in these days but HDFC Bank has stayed flat. The position in HDFC Ltd. gained 126 per share (2,089 - 1,962.85). The profit in this trade is Rs 63,075 for 1 lot of 500 shares. HDFC Bank moved up marginally to a level of 2,338.35 during the same period. There would be a loss of Rs 7.65 per share (2,330.7 - 2,338.35). There would be a marginal loss of Rs 3,825 in this trade for 500 shares. The total profit one could generate after squaring off the entire transaction would be Rs 59,250. Now you know how ratio charts can help you make massive gains by trading pairs of stocks. Do make sure that the pair of stocks you select are highly correlated to each other. Also note that trading in derivatives is risky and requires huge capital. One should venture in to derivatives only if one is comfortable with the thought of losing the entire capital. Chances of loss in pair trading are high if there is a stock specific development like scams, mergers, takeovers etc. Such corporate events can push even highly correlated stocks out of sync. Pairs can drift and diverge sharply at times despite being highly correlated. So, it is important for traders to maintain a stoploss based on price as well as time. Despite all the negatives pair trading offers an exciting opportunity to traders to make big profits with limited risks. If you want to have more insights on pair trading or ratio charts then do tune in to Profit Hunter Pro where I don't just share trades in fundamentally strong stocks but also share trading insights and strategies you won't find anywhere else. 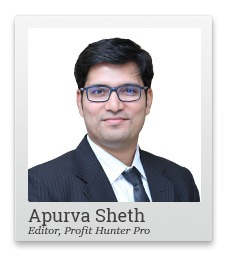 PS: Apurva has 4 open trading recommendations you can act on right now. With profits like 9.78% in just over two weeks - why would you miss out? Join him now. Equitymaster requests your view! Post a comment on "Pocketing Massive Gains with HDFC And HDFC Bank". Click here!